Tess finally made bail. Her mechanics called to say they’d finished the latest round of repairs: The new header tank was in; the leaking oil sump quick drain had been replaced; and the fuel pump gasket was squared away. Come pick her up. Reviewing the invoice, I saw that changing the fuel tank gobbled up thirty-two man hours. They had to disconnect the sundry fuel lines, unhook all the controls and cables in the cockpit, remove most of the radios and other modern gear, unbolt the tank from its brackets, drop it to the floor, then maneuver it up over the seat and out through the top of the canopy. Then they had to do the opposite with the new tank, then bolt it in place, reinstall the radios and other modern gear, hook up all the cockpit cables and controls, and connect all the sundry fuel lines to the new tank. This is considered a “plug and play” installation by one Ercoupe expert I talked to about swapping header tanks. I also noticed the shop rate had gone up ten dollars an hour from the last invoice. My pay has not. 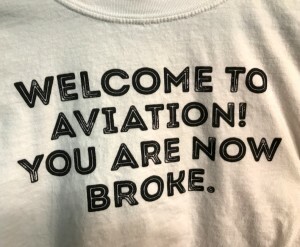 I dealt with that by buying a T-shirt that says: “Welcome to aviation. 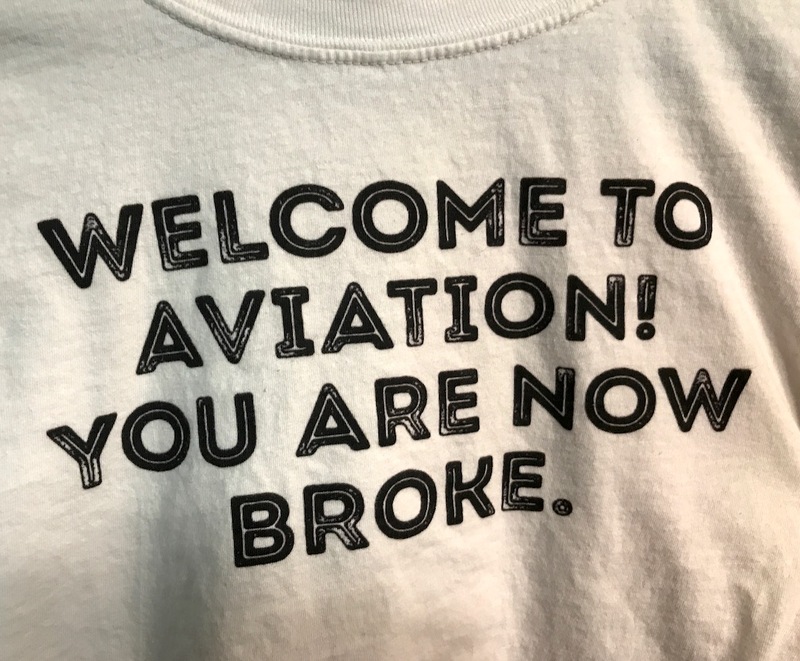 You are now broke.” It seemed like the right thing to do with the last $14.99 in my retirement fund. But at least the latest round was behind me. And there’s really not much left on the plane that hasn’t been either refurbished or replaced. Tess isn’t a 1947 Ercoupe any more. She’s a 2013-2014-2015-2016-2017-2018 model. All she really needs now is a new paint job. But that’s a tale for another day. I handed my mechanic another check that had a number which included a comma, and sat down on his leather couch to check the weather. Ut-oh. It was getting windy back home. In Santa Fe it was as nice as it could be. In Santa Rosa the wind was 18 miles per hour. Gusting to 30. I don’t like gusting, especially when the gusts are nearly double the base wind speed. It makes for unnecessarily exciting landings. The winds were forecast to remain high until sunset. Aw, hell. I had a decision to make. Ercoupes are great crosswind planes. Because their landing gear lets them land practically sideways, they can handle wind better than pretty much any plane out there. And I’ve landed in some pretty hairy wind. But there’s a difference between landing in hairy wind when you have to, and choosing to go and put yourself out in a hairy situation. I was confident I could do it, but was it worth it? Just to get the plane back home again? I grumbled to myself for a while, and finally, my chief mechanic, who had been sitting politely at his desk said, “I’m going to go back to work while you make up your mind,” and then disappeared out his office door into his hangar where two Civil Air Patrol planes were getting annuals and a local flight school 172 was getting its bent firewall replaced following a nose-heavy landing by a student pilot. I looked to the next day’s weather. It, too, was windy as the dickens. But the day after was forecast to be lovely. Doubting myself, as always when it comes to this kind of thing, I choose to wait. I wandered out into the hangar, then outside where Tess was tied down. I put her gustlock in place, grabbed the keys, buttoned up the canopy, patted her on the spinner and went back to the car. At Starbucks thirty minutes later I found myself checking the wind again, just to reassure myself it was still windy and that I’d made a good call. I ran a few errands then headed home, to find the wind had gone home to where ever it lives as well. It was a calm evening. If I’d just waited an hour or two the flight, and landing would have been uneventful. I kicked myself, but I also knew the old adage it’s better to be on the ground wishing you were in the air than to be in the air wishing you were on the ground. The weather the day after tomorrow is still forecast to be lovely. And Tess is happy to wait. Lisa was somewhere under the plane, scooting around on the wheeled creeper checking screws and rivets on the plane’s belly. I could hear her contented humming over the dull gong—gong—gong—gong of the hangar doors as they shifted and moved in the wind. It was a blustery day out so we’d buttoned up the hangar for preflight, leaving us in dim light, but warm. I was sitting in the cockpit re-attaching the iPad mount to the panel. Its suction cups had come loose again and it fell off and banged me in the knee when I climbed into the cockpit to check the Hobbs reading. To get the bracket positioned correctly I had to hunch down and peer upwards from underneath it, and despite having tri-focals, I couldn’t get any of the three lenses to line up right so that I could see what I was doing. I took my glasses off, reached up blindly, and set them somewhere on the glare shield above me. The happy humming from underneath the plane ceased. I couldn’t process what was happening. “Huh?” I finally managed to squeak, my hands frantically searching for my glasses. I couldn’t recall doing anything arrest-worthy. Not recently. Not ever, really. I live a pretty square life. Could it be a case of mistaken identity? My fingers located the frames and I slipped my glasses onto my face. The towering blue blurs of the cops snapped into focus. There were two local cops, and one state cop. But the other three were two uniformed paramedics and the airport manager, who was wearing a police-style jacket and a big grin on his face. Then all the men starting laughing. Then he told me that a boy who lived next to the airport had reported that a plane taking off that morning didn’t sound right. This kid hears a lot of airplanes. Apparently some odd transmissions had been heard by someone else, and Center couldn’t raise the pair of aerial mapping planes that had been working out of SXU for the last week. The local emergency responders were worried that they had gone down. Would we mind going up and just flying around to see if we could see anything? We wouldn’t mind. And we could do even better. 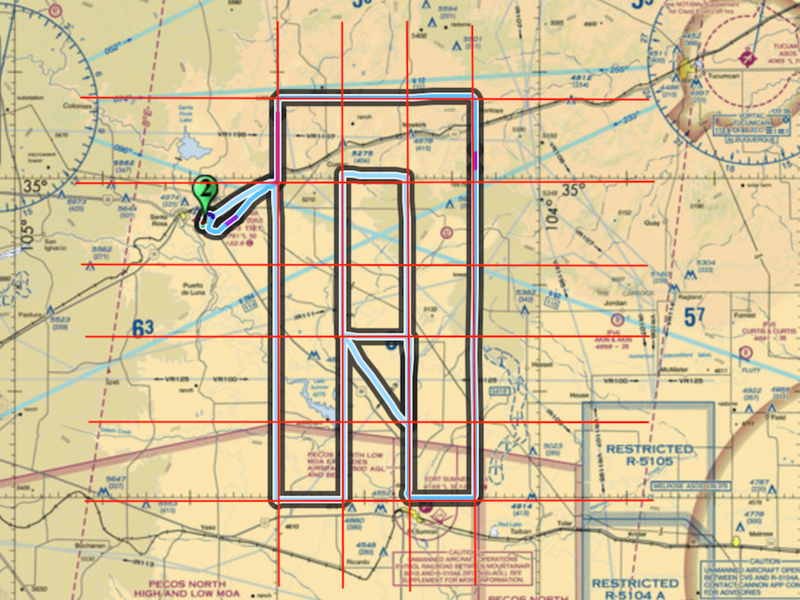 The latest version of our navigation app, Garmin Pilot, will display Civil Air Patrol search grids. We could fly a search grid to the south and east of the airport, in the direction the boy saw the plane go. In no time we were in the air. “What am I looking for?” asked Lisa. It was a grim image to contemplate. “Oh, and disturbed earth,” I added, “ like a scar of a freshly plowed field in the middle of nowhere.” I’ve seen several crash sights from the air, and none of them looked plane-like. We’d just barely finished the first leg of our search grid when the airport manager texted Lisa to report that Center was in touch with the two mapping planes, and all was well with them. He’d checked the guest register at the terminal and the history on the gas pump, and there was no evidence of another plane leaving that day. Lacking any other evidence of a plane in distress, he was calling off the search. 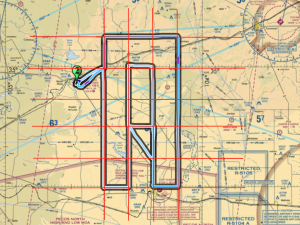 So we flew up one grid line, and down the next. Then up again, then down. Each line about eight miles apart, our eyes searched from Tessie’s wing roots to four miles off her wings. We flew a thousand feet off the deck, low enough to clearly see what was below, high enough to see a ways away. In some areas I could be confident there was nothing to see. In other areas filled with trees and craggy ravines I knew we could fly past a hundred downed planes and not see a trace. In about two and a half hours, we “searched” 960 square miles. At one point there were odd squawking noises on the emergency frequency. It wasn’t the mournful wail of an emergency locator beacon, it was more strangled. We cut across one search grid diagonally to check a network of small canyons but there was nothing to see and the choked noises on the radio went away. The radio was silent for the rest of our search, and we saw nothing out of the ordinary. Still, I was glad to be there at the right time and at the right place to lend a helping hand. Oh. Right. And I was even doubly glad that three wasn’t really a warrant for my arrest! Just when I thought all of our maintenance woes were behind us, I opened the hangar door. Here’s the Tale: Rio and I had mapped out a good training flight. Don’t ask me the details now, I’ve already forgotten them, but I certainly remember the rest of the day. We grabbed a light breakfast, loaded up Grandma Jean and R2D2 (her oxygen concentrator), and headed out to the airport. Grandma wanted to see Lisa’s recent renovation of our Third World airport terminal and said she’d hang out there and soak in the vibe while Rio and I flew for an hour or so. It was a lovely morning, not too early and not too late, neither too cool nor too warm, and the wind was just barely stroking the surface of the earth with a lover’s touch. When we arrived at the hangar we parked in front of the double doors so Grandma could see her airplane. I unlocked the padlock, then I took the right door and Rio the left. We dramatically pulled the great doors open at the same time—like the curtains in an old fashioned theater at the start of the show—revealing Tess, the morning light kissing her canopy. 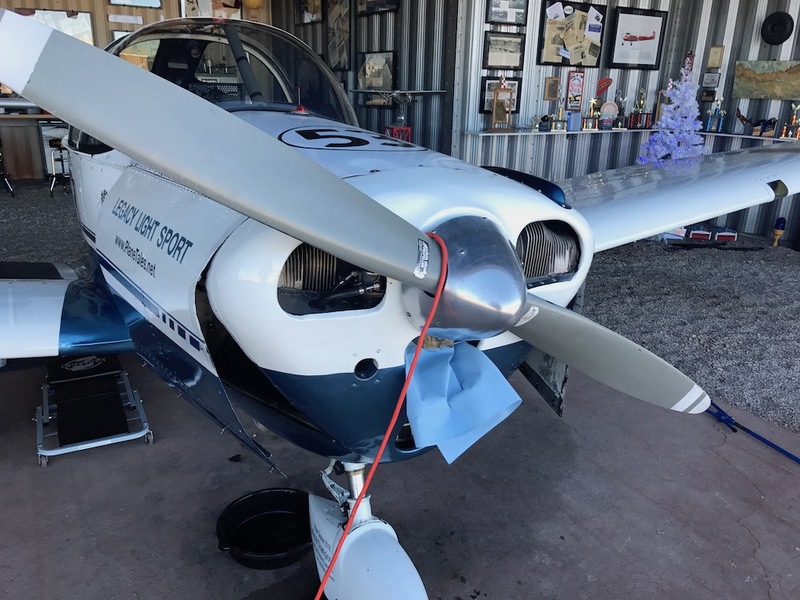 Above her the flags in the hangar undulated gently in the morning breeze, and with her sharp wing dihedral she looked ready to jump into the air… Except for the fact that she was sitting in a puddle of her own oil. Damn. What’s this going to cost me? Actually, as we know we have a soon-to-be replaced leaky gas tank, at first I mistook the dark pool for fuel. But kneeling down and running a finger through it, I found it to be slick, honey-colored oil. What the….? The pool was centered under and around the front nose gear. Where did it come from? Now oil leaks from Continental engines aren’t rare. Some folks joke that like a Harley, if it ain’t leaking oil, it’s surely out of oil. But this was something new. The sides of the cowl were clean, as was the front wheel pant, plane’s belly, and the hangar floor underneath the breather tube. Adding to the mystery, after our last flight the week before, Lisa and I had stayed in the hangar a good two hours, cleaning up the plane, listening to the CTAF, smoking cigars, and soaking in the whole airport vibe; and in those two hours no oil had leaked. So how did this much oil escape an engine that’s not running? And how’d it get from the engine, where it belongs, to the floor, where it does not belong? Of course, oil is a funny thing. A little spilled oil looks like a lot. To my many-times-bitten now crazy-shy eye, it was the entire contents of the oil sump. In reality it wasn’t even enough to detect missing on the dipstick. Still, not understanding what was going on, I cancelled our planned flight. Rio thought I was being a bit of a wuss, but he didn’t argue the point, and thus began the Great Oil Leak Investigation—a tale not likely to knock Sir Arthur Conan Doyle out of first place anytime soon. We opened both sides of the cowl and looked for oil. Naturally, as we rarely clean the inside of the cowl, there was oil everywhere. Shining my handsome new Tessie-blue 100-lumen Eddie Bauer aluminum flashlight around inside the engine compartment I felt like an explorer of yore trying to trace the source of the Nile. 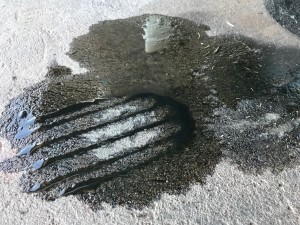 Let’s see here… These two little streams of oil seem to connect to that stain here, which seems to come from up there, so the oil must be leaking from the… alternator? No, that can’t be right! I took a ton of photos with my iPhone and emailed them to my beleaguered mechanic (who responded two days later that it didn’t look like that much oil to him, and if it was him, he wouldn’t worry about it). Then, using many pale blue paper shop towels I cleaned the inside of the engine compartment better than anyone had in the last 71 years. I placed clean folded towels in various strategic locations and we left for the day, Rio predicting that we’d come back to a clean airplane and clean towels. He was half right. A couple of days later we came back to clean towels, and more oil on the floor. 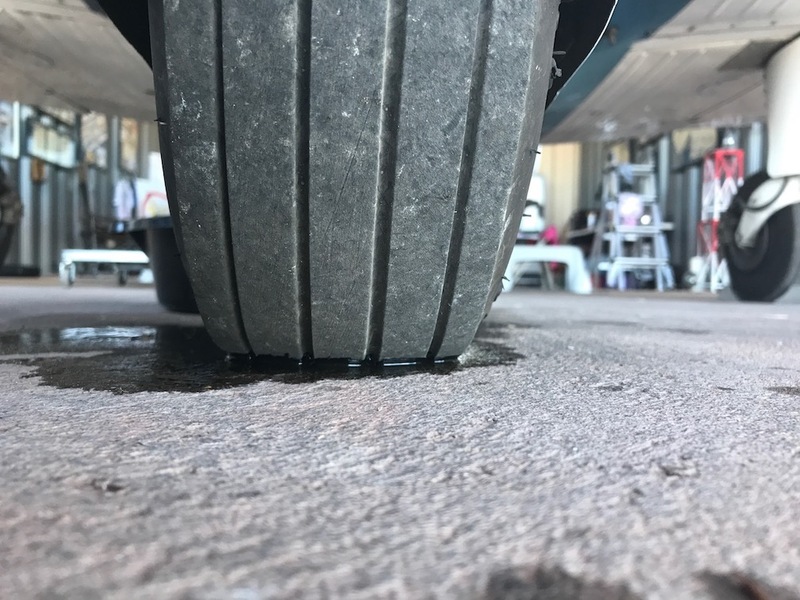 It was as if the oil were welling up from the concrete below the plane. I had a brief vision of the start of the Beverly Hillbillies, with me in the role of Jed Clampett, but I knew I hadn’t struck oil. Tess was leaking it from somewhere. 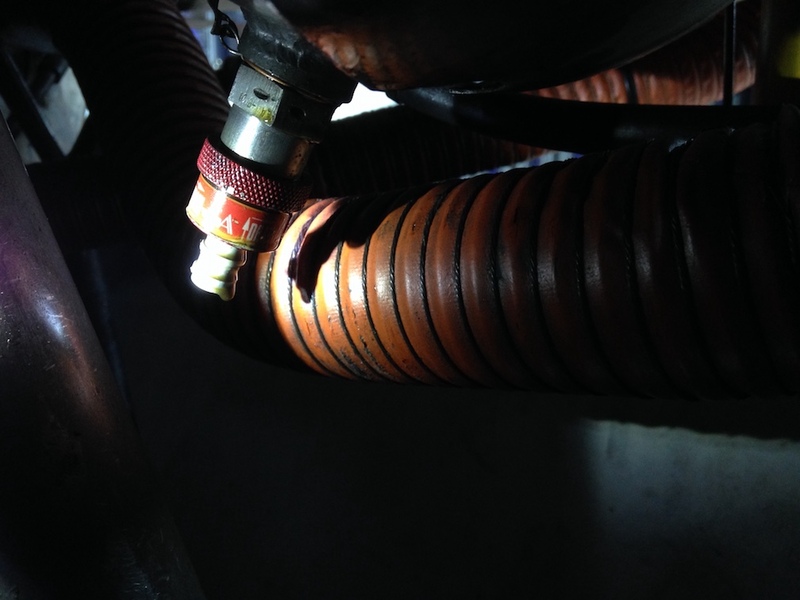 One of the leading contenders from the previous week had been the gasket between the fuel pump and the engine case. There was a clear sign of a leak there, but how that gasket could leak in the absence of engine pressure was a mystery to me, and now the towel below it was clean. The other contender was the valve cover on the number one cylinder, which was also leaking a drip or two, but it could hardly have been the culprit with a resting engine, and again the towel there was clean. And yet, there was fresh oil on the ground. 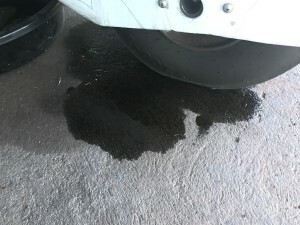 Adding to the mystery was the fact that oil spilling pretty much anywhere from inside the engine should come out of the bottom of the cowl where the front fork comes through the metal surrounding the engine, but oil exiting the compartment there would stain the front wheel pant, and it was clean. Complicating matters was the fact the oil had just been changed and it was still clean, making it almost transparent. Lying on the concrete, trying to avoid getting oil on my shirt, I carefully studied the front fork. It had a smooth sheen of oil on it, as did the aft scissors assembly. Mentally, working slowly backwards, I tried to envision the path of the oil, and it led me to the oil sump drain. Suddenly the clouds parted, the sun came out, and it all made sense. When the engine is off the oil drains out of the case and down into the sump. The only logical place for oil to leak from when the engine is powered down is from the sump. I reached in and fussed with the quick release valve used to drain the oil out when changing oil. Of course I had no idea how it worked normally, which made it challenging to see if it wasn’t working right. Twisting, tugging, pulling, I managed to accidently open it. A gush of gold oil flowed out. Mesmerized, I watched its travels. As the little stream twisted and turned around various obstacles in its path all the mysteries fell by the wayside. I’d found the source of the Nile. Now the challenge was to figure out how on earth oil was leaking from the drain. There were three possibilities. The mechanism itself could be failing, it wasn’t closed right, or it might not be screwed on exactly tight enough. 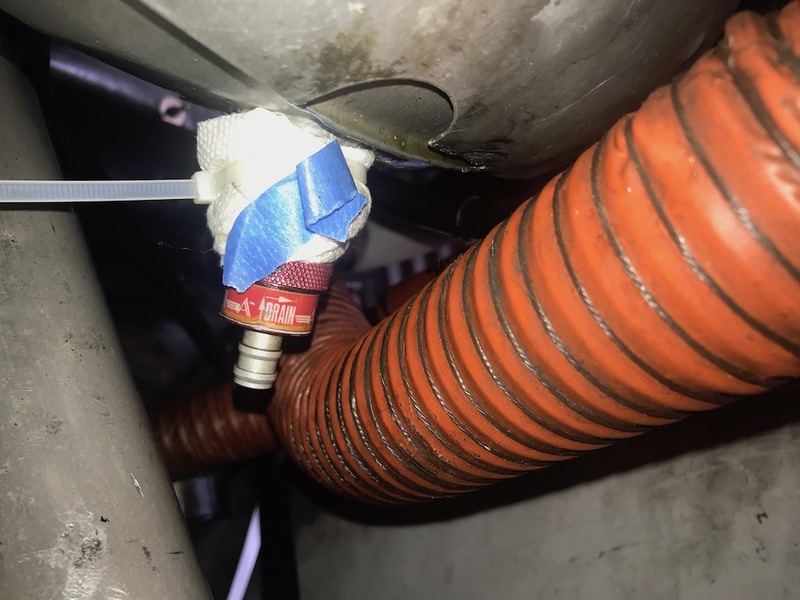 To rule out the last possibility, following instructions from one of our two mechanics, I took a paper towel and wrapped the upper part of the drain like a mummy, using a zip tie to secure the towel. Then I flew. And left the towel in place for a week. When I returned, there was new oil on the floor and the towel was clean. Well, not clean, but not oil soaked. A new sump drain was ordered and my guys will put it in this week while Tess is visiting them for a new header tank. Once that’s done, I’m confident that all our maintenance woes will be behind us. Until I open the hangar door again.